(New Orleans, LA) — Abita Brewing Company has released an alcoholic version of their famous root beer, the first product in its line of ‘Bayou Bootlegger’ hard sodas. 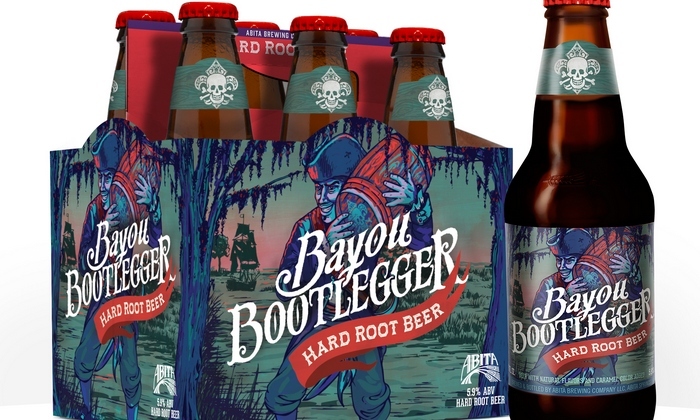 Bayou Bootlegger Hard Root Beer is based on the same root beer formula Abita has been craft brewing with pure Louisiana cane sugar for more than 20 years, and brewed to achieve a 5.9 percent alcohol by volume (ABV). The brew is all natural and gluten free. Six-packs of the hard root beer are expected to hit store shelves in Louisiana this week, with national distribution by early 2016. Abita is combining its brewing team’s expertise in both beer and non-alcoholic root beer together to bring a superior tasting product to a category that is drawing major interest from consumers. And for some it’s been a long time coming. Abita Root Beer also has a strong cocktail history among bars and restaurants in New Orleans, with many incorporating the local soda in featured drinks for patrons. Abita currently produces more than 14,000 barrels of root beer annually in its state-of-the-art brewing facility. Its root beer is made with a hot mix process using Abita Springs’ natural spring water, herbs, vanilla and yucca. Unlike most soft drink manufacturers, Abita only sweetens its root beer with pure Louisiana cane sugar. The resulting taste is reminiscent of soft drinks made in the 1940s and 1950s, before bottlers turned to corn sugar and fructose. Some soft drink makers add caffeine to their product, but Abita’s root beer is naturally caffeine-free. The alcoholic version of the root beer has a distinctive look as part of the new hard soda line, Bayou Bootlegger. Its flavor profile delivers aromas of wintergreen, vanilla and sassafras, with hints of clove and anise. To find Bayou Bootlegger Hard Root Beer in your area, download Abita’s Beer Finder app or visit https://abita.com/find_abita. Currently, Abita produces eight year-round beers and seven big beers, in addition to multiple seasonal and harvest brews, a select series, a root beer, and now a hard soda series. The company’s products are sold in 41 states, the District of Columbia, and in a limited number of foreign countries. Abita Brewing was ranked the 21st largest craft brewer in the country by the Brewers Association in 2014.